Our electrical labels are perfect for marking electrical boxes, conduit, circuit breakers, equipment and other electrical components. These quality labels provide visibility with a tough pressure-sensitive adhesive vinyl. We offer standard electrical labels as well as voltage markers with a reflective surface, making them great for visibility at night or in low lighting situations. 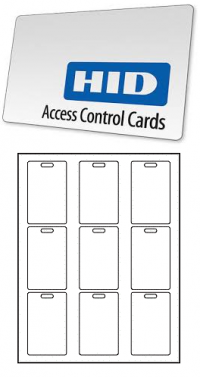 Our blank HID card labels come in a variety of materials and can be printed using your home Laser printer only. Easy, in your hand's method for marking wire and cable. Write-on Area: 0.50" x 0.625"
Network Connections Group USA is the global data communications company making any cabling trouble free with better products, design, and value, supplying the best and most cost-effective products for cabling in the world. We are the guys who not just sell you the best cables labels, but we are the guys who have worked in the cabinets all night labeling the cable and patch panels. We have used our products on over 65 of the top cruise ships in the world in areas from the USA, Canada to Europe.